Bacteria are single celled microorganisms, without a nucleus (prokaryotes), that can cause lots of morbidity and mortality. They are not infrequently seen by pathologists. A very large group of bacteria. IUD needs to be removed if found on a pap test - see gynecologic cytopathology. Part of the large Actinobacteria group. Mycete = fungus; these organisms have a fungus-like appearance. 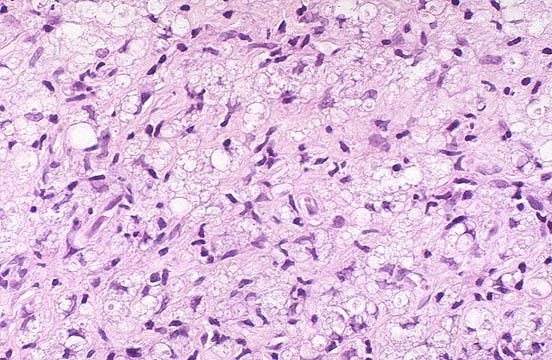 Typically form pink/purple granules ("sulfur granule") that is surrounded by inflammatory cells (lymphocytes or neutrophils). Sulfur granule may be seen grossly - yellow. May be confused with a fungus! Commonly abbreviated H. pylori or HP. Causes gastritis - specifically Helicobacter gastritis. Associated with peptic ulcer disease, MALT lymphoma and gastric carcinoma. Classic cause of pseudomembranous colitis. One virulent strain is: BI/NAP1. Resistant to fluoroquinolones (gatifloxacin and moxifloxacin). May be referred to as Chlamydia. TB has characteristics of Gram positive and Gram negative bacteria. Gram stain: subtle positive, often weak positive/little staining. Genetically closer to Gram negative microorganism than Gram positive organisms - when the whole genome is considered. PPD test, AKA Mantoux test, AKA TB skin test. Multiple drugs for a long time (months). Commonly used drugs: isoniazid, rifampin, pyrazinamide, and ethambutol. Peripheral focus - subpleural, calcified. Central focus - the hilar lymph node that drains the peripheral focus. Necrotizing granulomas with rod-shaped bacteria. Tuberculosis - case 1 - several images (upmc.edu). Tuberculosis - case 2 - several images (upmc.edu). Tuberculosis - case 3 - several images (upmc.edu). Ziehl-Neelsen stain - red rod-shaped bacteria - key feature. Very small - must use 40x objective. Can be diagnosed with PCR. Nerve damage -> injuries -> disability. Fite stain - red rod-shaped bacteria - key feature. Previously referred to as Mycobacterium avium-intracellulare, abbreviated MAI. Small rod-shaped organisms - within histocytes. Whipple disease - esp. in the duodenum. Epithelioid macrophages (i.e. a granuloma) surrounding a thin pink (fibrin) ring. Infections (Coxiella burnetii, CMV, EBV + others). Similar to pyogenic granuloma - see pyogenic granuloma. May be seen under nail - causes green nails. ↑ 1.0 1.1 Ventura, M.; Canchaya, C.; Tauch, A.; Chandra, G.; Fitzgerald, GF. ; Chater, KF. ; van Sinderen, D. (Sep 2007). "Genomics of Actinobacteria: tracing the evolutionary history of an ancient phylum.". Microbiol Mol Biol Rev 71 (3): 495-548. doi:10.1128/MMBR.00005-07. PMC 2168647. PMID 17804669. //www.ncbi.nlm.nih.gov/pmc/articles/PMC2168647/. ↑ Humphrey, Peter A; Dehner, Louis P; Pfeifer, John D (2008). The Washington Manual of Surgical Pathology (1st ed.). Lippincott Williams & Wilkins. pp. 446. ISBN 978-0781765275. ↑ 3.0 3.1 3.2 URL: http://pathmicro.med.sc.edu/mycology/mycology-2.htm. Accessed on: 14 September 2011. ↑ URL: http://pathology.class.kmu.edu.tw/ch05/Slide42.htm . Accessed on: 14 September 2011. ↑ Mobley, HLT. ; Mendz, GL. ; Hazell, SL. ; Andersen, LP. ; Wadström, T.. Basic Bacteriology and Culture. PMID 21290743. http://www.ncbi.nlm.nih.gov/books/NBK2444/. ↑ URL: http://www.medpagetoday.com/InfectiousDisease/PublicHealth/2254. Accessed on: 15 August 2011. ↑ McDonald, LC. ; Killgore, GE. ; Thompson, A.; Owens, RC. ; Kazakova, SV. ; Sambol, SP. ; Johnson, S.; Gerding, DN. (Dec 2005). "An epidemic, toxin gene-variant strain of Clostridium difficile.". N Engl J Med 353 (23): 2433-41. doi:10.1056/NEJMoa051590. PMID 16322603. ↑ Fu, LM. ; Fu-Liu, CS. (2002). "Is Mycobacterium tuberculosis a closer relative to Gram-positive or Gram-negative bacterial pathogens?". Tuberculosis (Edinb) 82 (2-3): 85-90. PMID 12356459. ↑ Kawakami, S.; Kawamura, Y.; Nishiyama, K.; Hatanaka, H.; Fujisaki, R.; Ono, Y.; Miyazawa, Y.; Nishiya, H. (Dec 2012). "Case of Mycobacterium tuberculosis meningitis: Gram staining as a useful initial diagnostic clue for tuberculous meningitis.". J Infect Chemother 18 (6): 931-6. doi:10.1007/s10156-012-0382-y. PMID 22476652. ↑ Atsukawa, Y.; Kawakami, S.; Asahara, M.; Ishigaki, S.; Tanaka, T.; Ono, Y.; Nishiya, H.; Fujisaki, R. et al. (Aug 2011). "The usefulness of changing focus during examination using Gram staining as initial diagnostic clue for infective tuberculosis.". J Infect Chemother 17 (4): 571-4. doi:10.1007/s10156-011-0216-3. PMID 21327691. ↑ Fu, LM. ; Fu-Liu, CS. (2002). "Genome comparison of Mycobacterium tuberculosis and other bacteria.". OMICS 6 (2): 199-206. doi:10.1089/153623102760092797. PMID 12143965. ↑ Rose, Alan G. (2008). Atlas of Gross Pathology with Histologic Correlation (1st ed.). Cambridge University Press. pp. 112. ISBN 978-0521868792. ↑ URL: http://pathhsw5m54.ucsf.edu/case32/image324.html. Accessed on: 27 February 2012. ↑ URL: http://www.medscape.com/viewarticle/576467_2. Accessed on: 2 January 2012. ↑ URL: http://www.meddean.luc.edu/lumen/MedEd/orfpath/bfsrinf.htm. Accessed on: 1 April 2012. ↑ Turenne, CY. ; Wallace, R.; Behr, MA. (Apr 2007). "Mycobacterium avium in the postgenomic era.". Clin Microbiol Rev 20 (2): 205-29. doi:10.1128/CMR.00036-06. PMC 1865596. PMID 17428883. //www.ncbi.nlm.nih.gov/pmc/articles/PMC1865596/. ↑ 19.0 19.1 Barankin, B.; Levy, J. (Oct 2012). "Dermacase. Can you identify this condition? Pseudomonas aeruginosa infection.". Can Fam Physician 58 (10): 1103-4. PMID 23064921. ↑ Hengge, UR. ; Bardeli, V. (Mar 2009). "Images in clinical medicine. Green nails.". N Engl J Med 360 (11): 1125. doi:10.1056/NEJMicm0706497. PMID 19279344. This page was last modified on 7 March 2016, at 05:20.